I am currently in my residency training, with an ultimate goal of providing full spectrum care to underserved populations. 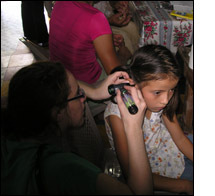 I had the opportunity to travel to Agua Salada, Honduras, as part of a medical brigade. In true family practice style, I was able to see all ages - from infants to the elderly, including a hospice home visit and prenatals. In addition to our nurse practitioners and physicians, we had nursing students, pharmacists, social workers, and a couple engineers who worked daily on constructing the new clinic - building walls, hauling dirt and rocks, mixing concrete. They were absolutely amazing! One visit in particular will stick with me forever. I heard of a woman who was bed-ridden for 2 months. With end-of-life care being an interest of mine, I asked to go see her. From the doorway I recognized her life expectancy was on the order of days to weeks. She was extremely weak, couldn't even speak, but obviously in pain. The only pain medications we had available were pills, which she could not swallow. I was able to give her IV dexamethasone by mouth, a steroid that helps with pain and nausea near the end of life. I left her house feeling frustrated that I could not provide more comfort in her last days. Later that evening, I sat down with the pharmacists and discussed how we could improvise to help her with pain and suffering. Our solution: we wrapped a Dum-Dum Pop with gauze, got it wet with water, and then dabbed on IV Valium, effectively making a Valium lollipop. In this way, she was able to have some pain/spasm control along with her candy. It could be titrated to effect depending on how much Valium was dabbed on the gauze. We returned the following day with her supplies to find her sunning herself on the porch - a completely different woman! The one dose of steroids gave her energy, helped her pain, and even made her hungry enough to have "steak" for breakfast. The frustration I felt the day prior melted away. This trip was invaluable to me personally and professionally, on many different levels. I will return, and hopefully make it a regular activity in my life. I very much appreciate the assistance the BHJ Fund offers, because without it, I wouldn't have been able to make this trip a reality. Thank you.